Montreal’s options for parties on New Years Eve continues growing for the December 31st festivities. Don't make the the simple mistake of not planning and booking in advance! Every New Year's Eve, Montreal Nitelife tells its clients to buy their tickets early, for the prices always go up as you approach the end of the year. Last year, we saw all-night open-bar tickets sell for under $100 in October/November and NYE tickets doubled in price between November and December or sold out before December! "We start organizing and preparing the New Year's Eve packages every September. Numbers keep growing every year. And as long as the feedback remains flawless, we'll continue to work our best to keep it that way." - Angelo D'Ambra, owner of Montreal Nightlife. Montreal's Best Nightclubs from dusk to dawn! includes shuttle service between clubs! All you need is your bracelet! Call it what you want, bar hop or club crawl...here is your chance to discover Montreal's incredible nightlife. 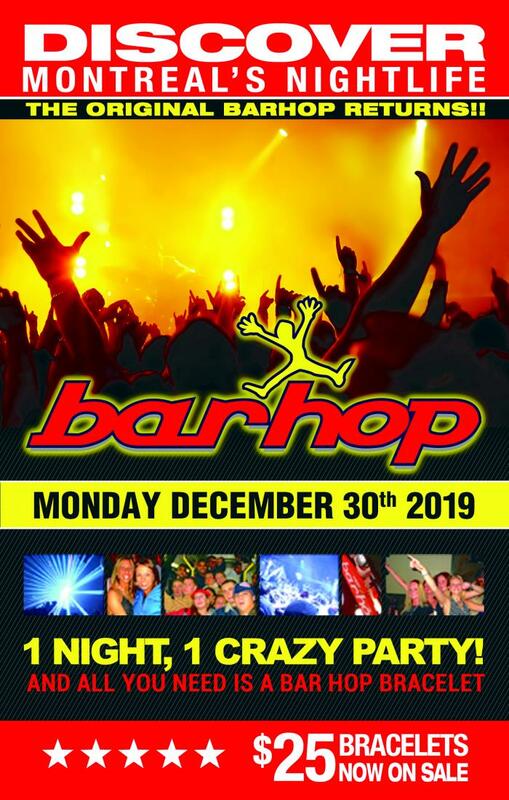 Journey to the land of dance, a world of R&B, a universe to Techno as the Montreal city-wide BAR HOP kicks off a night of non stop adrenaline pumping action. All you need is to purchase the bracelet. The bracelet entitles you to BAR HOP into Montreal's hottest nightclubs absolutely free! Shuttle bus service included. 18+ & over. Proper attire required.